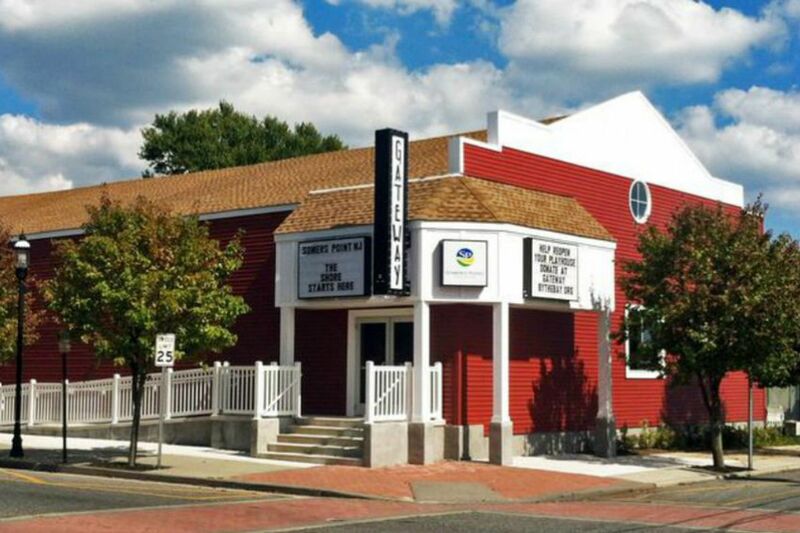 The newly refurbished Gateway Playhouse in Somers Point, N.J. An opening gala with singer Andrea McArdle is slated for Aug. 19. Welcome back, Gateway Playhouse. Somers Point embraces you. Opening as a warehouse in 1912, the building on 738 Bay Avenue has housed some kind of entertainment venue since the 1920s, be it movies or casinos or plays. In the mid-1970s, it became a dedicated playhouse. Known locally as "The Pink Theater," it lasted until 2005, when the nonprofit that owned it closed it down. Now, thanks to people who love regional theater, the Gateway is back. It joins the Surflight Theatre in Beach Haven on Long Beach Island, which reopened with a full summer schedule in June. It's an encouraging trend for people who want to see theater thrive down the shore. On Wednesday, Aug. 16, there'll be a gala ribbon-cutting ceremony, and on Aug. 19 and 20, Andrea McArdle, the original Annie on Broadway, will give two performances. On Aug. 19, the black-tie opening gala will feature food, drink, and a 7:30 p.m. show by McArdle. The next day she will perform a matinee at 3 p.m. Resurrecting the Gateway, an intimate 220-seater, has been a labor of love, lasting nearly a decade. "We've been working on this since 2008," says Keith D. Cooper, executive director of the nonprofit Theater Collaborative of South Jersey (TCSJ), which bought the theater that year. To quote the website, "The Playhouse was gutted down to the cinder block and sand and has been rebuilt from the ground up" for a future of plays, concerts, musicals, and other events. The effort was driven, Cooper says, by a love of regional theater: "Several of our board members had been in shows here and wanted it back because there was nowhere local to perform anymore." Besides the two McArdle shows, on Aug. 26-27 the Shaken Not Stirred Players will perform their popular Broadway By Request show, in which audience members pick Broadway songs at random and the troupe performs the shows in whatever order emerges. "All I want to do is get through the next week," says Cooper. "I've pretty much been living here." He tells a fascinating tale of how The Local Nonprofit That Could found a way to renovate an old building without going into hock. In 1976, Paul Aiken Jr. took over the building. Calling it the South Jersey Regional Theater, he created a year-round schedule of live performances, with casts that combined Equity actors and locals. Aiken died in 1999, and the theater was taken over by Bill Marshall until 2005, when the city of Somers Point bought it for $1.1 million. The city sold it to TCSJ "with a 10-year deed restriction," Cooper says, "because they wanted it to remain a theater." In the end, the collaborative and the theater emerged without a mortgage, "without owing anybody anything," as Cooper puts it. The Gateway's first full season will be 2018-2019. Cooper says he hopes for a season of two plays and six musicals, bringing back the Aiken-era model in which casts mixed Equity actors and locals. "We're trying," Cooper says, "to uphold the best standards of regional theater." Andrea McArdle: Opening Gala for the Gateway Playhouse. 7:30 p.m. Aug. 19, Gateway Playhouse, 738 Bay Avenue, Somers Point, N.J. Tickets: $125. Information: 609-653-0553, gatewaybythebay.org.